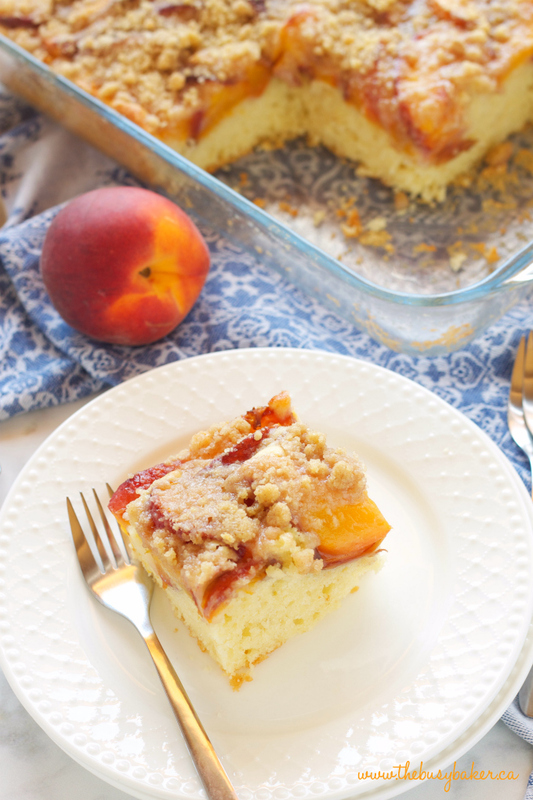 This Peach Streusel Cake is the perfect summer dessert with a tender cake base and a delicious streusel topping – make it with fresh or canned peaches! I don’t know about you, but every single year I look forward to peach season. Living in Eastern Europe affords us the luxury of getting all the delicious fresh produce early from countries just below us like Italy, Spain and Greece and the fresh peaches start arriving at our Farmer’s Markets long before peach season here in Romania. 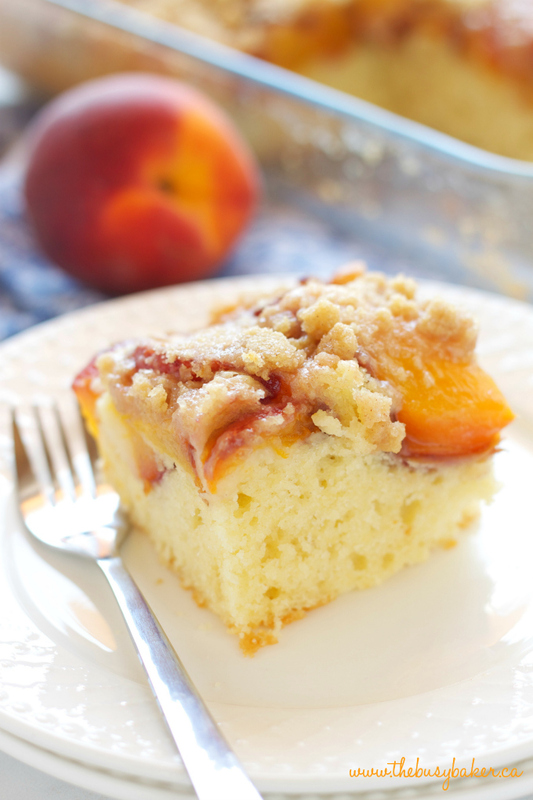 I make this Peach Streusel Cake every single year (ok, multiple times a year!) 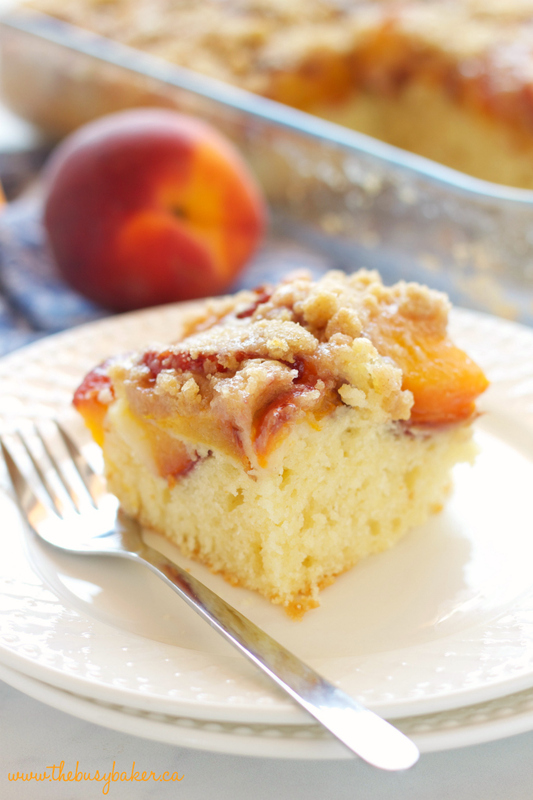 because it its truly the best Peach Streusel Cake you’ll ever taste! 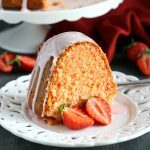 The white cake base is so easy to whip up and it’s such a tender and moist cake, perfectly complimenting the fresh peach layer and the crunchy streusel topping. 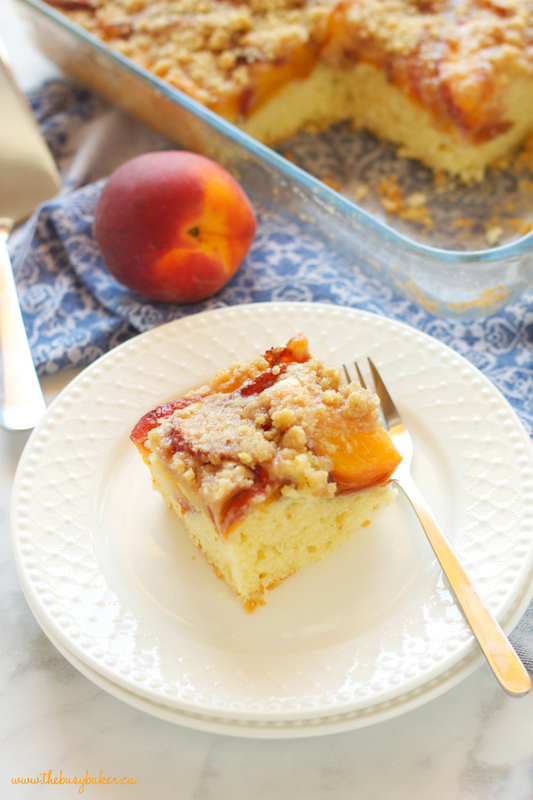 If you’re looking for summer dessert that will impress, this Peach Streusel Cake is it! 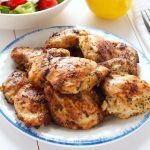 And if you don’t want to wait for fresh peach season, canned peaches work very well in this recipe! 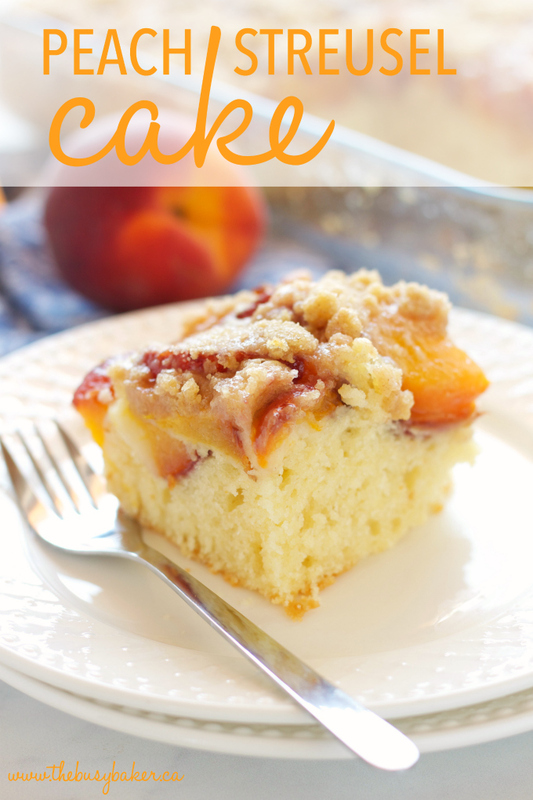 I hope you like this Peach Streusel Cake recipe as much as we do! 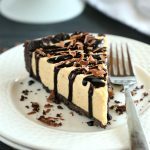 Let me know in the comments below, what other summer desserts would you like to see on thebusybaker.ca? I’d love to know! 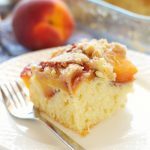 This Peach Streusel Cake is the perfect summer dessert with a tender cake base and a delicious streusel topping - make it with fresh or canned peaches! Wash 3-4 large peaches and chop them into bite sized pieces or slices (you'll need about 2 and a half cups of chopped or thinly sliced peaches to cover the cake.). Set them aside in a bowl while you prepare the cake batter. Grease a 9x13 rectangular glass cake pan (or a metal pan) with some butter and pour the batter into the pan, using the spatula to push the batter into the corners and even out the surface. Don't worry, the batter will seem thick but it's supposed to be like that. Spread the peaches over the top of the batter. Sprinkle the streusel mixture over the cake and the peaches, making sure to spread it at evenly as possible and into all the corners. Bake the cake at 350 degrees Fahrenheit for 47-50 minutes. 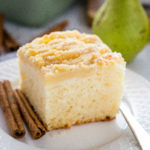 When it's finished baking the topping will be slightly browned on top, the fruit will be bubbly, and when you insert a toothpick into the centre of the cake it will come out clean. Let the cake cool for at least 25 minutes before slicing. That’s great Pat! So glad you loved it!! 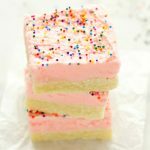 This cake is summer dessert perfection! This is so so cute and looks delicious!! Thanks! Wow this made me so hungry, looks yum! 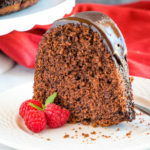 We enjoyed this so much for dessert last week that I’m making it again this sunny Sunday morning for a breakfast treat. I used my round spring pan last time and it turned out beautiful. Fresh picked blueberries from the farm is my choice this morning. 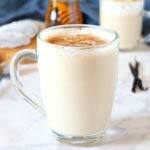 Yes, plain yogurt (not fat free, it should be at least 2% fat) will work in this recipe.